When you’re renovating any living space, you are able to customize the space completely to meet your needs. You can create space that wasn’t there before and find new ways to maximize the existing home. A condo is often associated with trendy living in an urban area. There can be some irregularities in the architecture, but those unique features make it an incredible space. These condo renovation ideas are broken down by room to make this renovation the easiest one yet. Kitchens are almost always a main focus of any home renovation. When you’re working with a condo, your rooms will be smaller than those in a full single family home. However, a small kitchen doesn’t have to be dark and cluttered. Condo renovation ideas are all about maximizing your space. Many condo owners decide to utilize an open concept floor plan to let the space look and feel bigger. This is a huge asset if you plan on doing a lot of home entertaining. There are a few different shapes when it comes to the layout of a condo kitchen. Some of them are open to the entire space and others are closed off completely other than one doorway. If you don’t want to knock down walls in your renovation, make the most of a closed kitchen. A smaller kitchen shouldn’t limit you, but rather inspire you to find more creative design solutions. You may be tempted to use every inch of space you can, but maximizing your space is really about leaving blank spaces and strategically using others. You can open up your room with clever design and highlight the shape of your kitchen instead of working against it. Changing a wall color or treatment can open up and brighten your space, even if it is enclosed by interior walls. 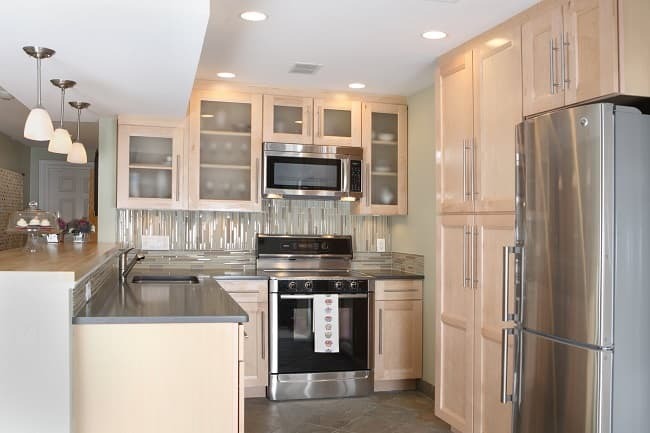 If you do have an open concept kitchen, you will want consistency in your wall colors. The exception to this rule will be an accent wall. The backsplash in your kitchen acts as an accent wall in a space that otherwise has limited wall space. One of the most popular tile choices in recent home trends is subway tile. These rectangular tiles add visual interest without overwhelming the space. You can create a bright space by using white tiles, or add a chicness to your condo with black subway tiles. They can also be arranged in interesting patterns. Herringbone backsplashes put the tiles at an angle to create a new design in your kitchen. You can also vary the overlap between the tiles by cutting the tiles to different lengths. For a more unique backsplash design, you can use penny tiles. These small circular tiles fit together to create a fish scale pattern. Some homeowners actually use pennies for a one of a kind look, but you can buy the tiles in different colors to best fit your space. Your kitchen floors finish out the frame that you started to create with your wall designs. Just like the walls, if you have an open floor plan you will want to use a consistent flooring material. Condo owners usually choose wood flooring for this design. It’s more universal in terms of the home than tile. If you decide to use tile exclusively in your kitchen, avoid a dated look by using large tiles. To modernize your kitchen further, choose a dark color tile that will contrast the lighter walls of your kitchen. By keeping the darker colors lower in the room and elevating lighter colors, the space feels more open. You can keep the floor one consistent color or add another layer of contrast by using a bright grout next to darker tiles. If you like to spend a lot of time cooking, you may want to invest in runners or area rugs for the places where you will be standing for long periods of time. This includes the floor in front of your sink and in front of the stove. There are tons of design for area rugs that are complimentary to any kitchen design. One of the most important parts of any kitchen are the countertops. Kitchen counters are the first thing people notice in a kitchen and are the major, if not only, surface in your room. A standard countertop material choice is soapstone. Not only is it durable, but it’s also very easy to clean. This makes it a no brainer for most kitchens. It has a wide color range that starts at a white base with some marbling in it to a solid dark charcoal. The range of grey tones means that you can easily find a soapstone counter to fit into any kitchen design. If you want a little more traditional or rustic look to your kitchen, butcher block counters add the warmth of wood to your space. While commonly found in farmhouse renovations, butcher block counters can fit just as well in a condo renovation. You can choose your countertop from different wood tones and different paneling techniques to create your ideal countertop. If you have an open concept kitchen, continue your countertop aesthetic into a kitchen island. This is a great gathering point for communal areas and adds more potential storage space. Use fun bar stools as seating for a casual place to eat dinner with friends. If your condo is too small to house a large island, replace it with a kitchen table and chairs. This still gives you a gathering point between your kitchen and living room. While lighting is an important part of any room in your condo, it has a particularly high importance in your kitchen. Being able to see what you’re doing while handling hot pans and chopping food is important for safety purposes. This doesn’t mean that your lights can’t fit into your design aesthetic. Using hanging pendant lights can help light a large area with only a few light fixtures. You can put them over your island or across an open walkway along your counters. If you want more concentrated lights, under cabinet lights can easily be installed. You can have professional light fixtures put in, or install rope lights in a waterproof casing as a DIY project. Use your storage as a decoration tool to fill your space without overcrowding it. Open storage not only displays your items, but keeps the room from feeling too cramped. Using traditional cabinets can make the space feel smaller. Glass front cabinets allow the pass through of light and opens up the space. For a completely minimalist approach to your kitchen storage, open floating shelves create a display for interesting serving dishes. Whether they provide a pop of color in your kitchen or just have a unique design, show them off! The living room is a focal point in any home. It is a communal area that is key to comfortable living and home entertaining. In a condo, the living room is often the largest area and is the bulk of the design. This creates a blank canvas that is open to any design aesthetic that you choose to apply. 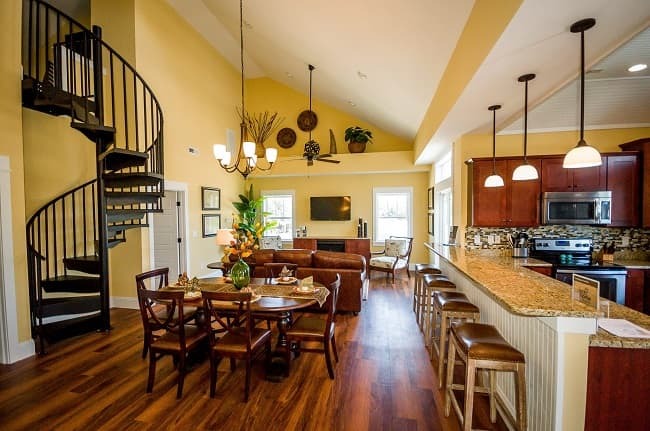 If you have an open floor plan, the kitchen and living room probably flow together seamlessly. Even if you have a closed off kitchen, you’ll want condo renovation ideas that center on cohesion. Condo living rooms often run the span of the unit, creating large wall spaces. While it may be tempting to use these large walls to make a statement, simplicity is best. Overdesigned walls that are large can feel overwhelming and close off your space. Very dark colors can feel heavy if used in a large solid area. If you want to use a dark color on your walls, incorporate them into a painted pattern. Accent walls that feature hand painted patterns and textures give the eye something to focus on in a particularly large space. Exposed brick walls can give your condo renovation an urban edge. For a rustic touch to your space, ship’s lap walls and wood paneling can easily be installed as a DIY project. Another factor to mention with condo walls are the large windows that usually come with it. Natural light will make your space feel bigger and brighter. If you have a multi floor living room with a loft or mezzanine space, take advantage of the height and use oversized windows. The more natural light in your space, the better. Choosing a flooring material for your condo living room will depend on the full floor plan of your condo. A lot of people like the look and feel of carpet in their living room. It’s a comfortable surface to walk on and can give the room another touch of luxury. However, if you have an open floor plan, wall to wall carpet can be difficult and impractical to maintain. Hardwood floors are the most common design option for an open concept. There’s a large range of natural wood tones that can fit well into any space. If you still want the carpet feeling in your space, area rugs are a great solution. They can add softness to your floor in high traffic areas and help to define spaces in an open floor plan. By using an area rug, you can show a concentrated area in a larger space. Be sure to choose a rug that overlaps your furniture in the area just enough. If your rug is too big, it will make your space look smaller. The most important furniture in your living room is going to be comfortable seating options. A large upholstered sectional couch is the most common seating option in these spaces. It gives you a large amount of seating choices and is perfect for any entertaining you may be doing. If you want a more compact way to provide lots of seating, multifunctional furniture can be as small or as large as you want. Multifunctional ottomans are a great choice. When you don’t need any extra seating, it can function as a standard ottoman. However, should you need more seating, it breaks up into six small stools. Coffee tables are another defining piece of furniture in your living room. They give you a center focus to place your furniture around. They also provide a flat surface for casual entertaining that may not call for a full dining table. When looking for a coffee table that will fit into your design aesthetic, the materials will make the difference. Gold framed tables have recently become popular to add a touch of luxury to your living room. If you want to allow for the maximum amount of light to pass through the space, a minimalist style acrylic coffee table will be a subtle supporting piece. For lighting in a larger living room, you can go a little bigger than you would in other areas. Large pendant lights or chandeliers are popular options for these wide open spaces. A chandelier doesn’t have to be a large crystal piece. It’s simply a tiered light fixture that hangs from the ceiling. If you want to add an artistic touch to your condo, gallery walls can incorporate a ton of different sizes and shapes to create a dynamic wall installation. Oversized mirrors are a modern way to add interest to your living room and make it feel larger. The frame can be whichever design fits best in to your space. 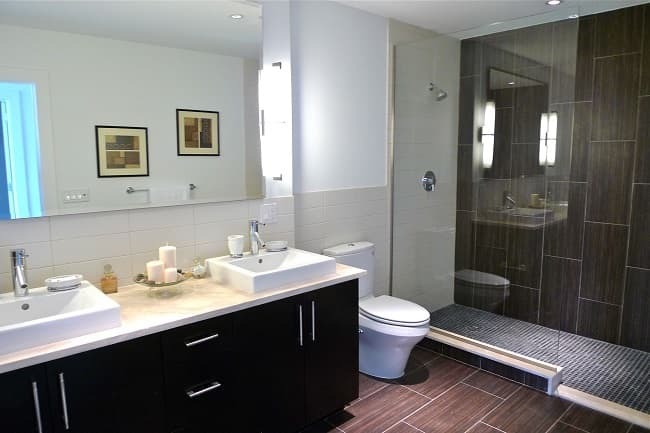 Often condo bathrooms are a small and cramped space that doesn’t allow for extra design. These rooms require a strategic layout and design to be incorporated with multifunctional pieces. By renovating a condo, you’re able to out the focus on what you want to be most important in your bathroom. You have the flexibility to either completely redo the bathroom, down to the placement of appliances, or just do simple updates to the existing designs. If you want to keep the updates simple, it can be as easy as replacing the materials used. Different materials will create different aesthetics even if they’re used in the same way. 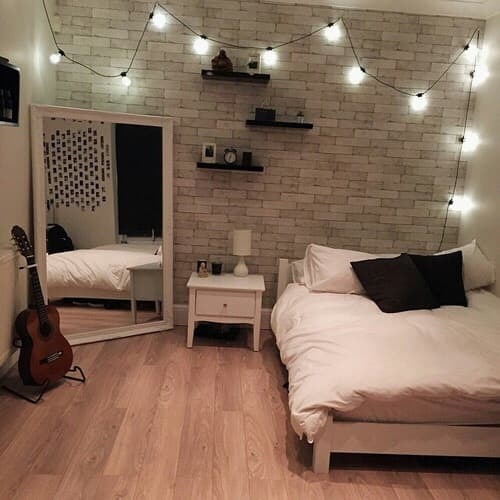 By simply changing the walls, you can update the entire room. This can either be a coat of paint or retiling an entire section of your bathroom walls. If you want to keep it simple by repainting the walls, you should keep them a lighter color. Because bathroom designs benefit from a lot of natural light, a lighter color will help to support any light you let in. If you plan on getting ready for the day in your bathroom, be sure to use colors that you like to wear. This may seem like an odd correlation, but you’ll feel better about seeing yourself against this color constantly. If you plan on retiling your bathroom walls, there are several different aesthetics you can achieve depending upon your material choices. A recent home design trend is a simplistic and minimalist design. These bathrooms usually feature black and white as the primary colors and subway tiles for the walls. These tiles can be kept in the standard straight design or can be installed in geometric patterns to create a visual interest without overpowering the space. If you want to keep a classic design in your bathroom, tile flooring is the way to go. Just because it’s a traditional design doesn’t mean it has to be boring. Update a basic square tile floor by using a dark color to contrast the lighter walls. Hexagon tiles are another modern update to this traditional design. They come in a large variety of sizes and colors to create your desired look. Your flooring options aren’t limited to tile. Contrary to popular belief, wood flooring is a great choice for your newly renovated bathroom. Your floors would simply need an extra coat of varnish on them as a protective layer from any extra moisture. While this is helpful, it’s not a foolproof way to protect against any water damage. The best way is to keep any standing water on your wood floors to a minimum. If the idea of real hardwood floors in your bathroom still makes you nervous, there are faux wood options that can give you the same effect. Both laminate flooring and ceramic tile have options that look like a real hardwood floor. They are water resistant and will save you some extra maintenance later. When it comes to the furnishings in your bathroom, it’s all about the layout in your space. Put the focus on the most important parts of your bathroom and work your design around them. A large portion of homeowners that are looking to redo their bathroom want to update the space, but not go through the hassle of replacing bathroom furnishings. This sometimes requires new pipes and a larger budget than planned. Simple updates to your existing bathroom furnishings can be a cost effective way to reinvent your space. For bathtubs and showers, it may seem like a new piece is the only way to redesign the space. There are several surface changes you can make to create a new space. If you have a bathtub and shower in one, changing the placement of your curtain can make all the difference. Raise the curtain up to the top of the wall and install a valance to hold the shower curtain. The tall installation helps the space to feel larger. If you want to add another touch of elegance to your space, use two shower curtains and tiebacks to frame the space. A claw foot tub is another piece of furniture that can give your bathroom a truly luxurious feeling. If you have a shower stall in your bathroom, you can still update it to look and feel more modern. Replacing fogged glass with completely transparent panes can update an old fixture that’s dating your space. The clear glass will open up your space and help it to feel larger. The last major fixture to update is your bathroom sink. This not only includes the sink itself, but also any counter space that may be housing it. A sink that doesn’t fit a design aesthetic can look out of place and interrupt the flow of your space. A large farmhouse sink is perfect for a simplistic bathroom that is looking for statement pieces. The apron front makes a statement without distracting from the rest of the room. A sleek and modern sink can either have a square or round basin. As long as it has clean lines and is a solid color, it will fit into your modern design aesthetic. If you want to update your sink without replacing the entire fixture, consider replacing or painting the faucet and knobs. This is an easy DIY update that can change the entire look of your sink. Your counters can easily be painted to create a new look for your bathroom. If you want to replace your counters, but want to stay in budget, staining a basic concrete counter can give you a marble look. The stains react with the concrete itself to create a completely unique counter top for your home. When you have a small space, organization is a major factor. By having effective storage and organization, you can keep your space from feeling cluttered or even smaller than it is. The best way to do this is to combine storage and design. A small space requires some storage to be display pieces as well. Floating shelves are a modern way to store your products without closing off your already small space. Small baskets can provide extra coverage when you’re using open storage solutions. The individual shelves can be installed wherever you may need them. A common place is right above the toilet to create a faux built in piece. Another way to maximize the storage space in your condo bathroom is to utilize previously unused space. This can include hidden storage or just clever placement of the open storage options. For a hidden spot, utilize any nooks you may have in the room. If there is a small wall between your shower and the toilet, install a slide out shelving unit. If you don’t have any secret nooks, you can still have strategic storage. One place that is almost always open is the wall space right above your door frame. You can install a floating box shelf above the top of your door to hold things like extra towels or toilet paper. Condos have a lot of unique floorplans and layouts. The range from a large standard floor plan with separate bedrooms and multiple floors to wide open spaces with a studio design. All of these plans call for a different bedroom design and a unique take on the traditional bedroom. Whether it’s a loft bedroom design or a closed off room, you want this space to be relaxing and comforting. If you do have a standard bedroom, you will need to consider wall treatments for your space. If you’re completely renovating a condo, you have the option to add walls as well. The key to a relaxing bedroom is to use soft colors that won’t overwhelm the space. You may like the coziness of dark colors, but they can make it more difficult to get out of bed in the morning. Instead of feeling refreshed, you’ll feel fatigued and groggy. Soft neutrals and greys paired with pastels create a color story that promotes relaxation. Instead of stark color contrasts, textures can add visual interest to your bedroom. White washed wood paneling can add a dynamic element to an otherwise basic design. You can add an urban edge to your otherwise very soft bedroom with an exposed brick wall. Statement walls can be used in place of a headboard to have that interest, but keep the room simple. Keep the flexibility of the space open by using a barn door instead of your standard interior door. Barn doors are very large and can be slid to the side to have an open space. This keeps air and light flow open when you want it, but you can close it for privacy as you need it. If you have a bedroom loft, you can create walls by using multifunctional pieces. Open back bookshelves provide both storage and a privacy screen for your bedroom area. Fill the open cubbys with different things to keep that barrier closed. However, the open space around those pieces still allow light through. For studio style spaces, hardwood floors are the best option. Wide floor panels keep the flooring smooth and subtle. There are plenty of different wood flooring options that can fit into different design aesthetics. When you have one large living space, you want consistency in your home design. If you have a separate bedroom, carpeting is a popular option. The soft flooring provides comfort and warmth, which are ideal for any bedroom. If you have a studio space, or simply like the look of wood, you can always use area rugs to supplement it. Because it’s a smaller space than wall to wall carpet, you can use more expensive materials. A popular location for bedroom area rugs is right next to the bed. You can step out of bed and onto a soft rug first thing in the morning instead of stepping on a cold wood floor. Your bedroom should be the one room in your condo that you absolutely love. It’s the place where you can relax and just enjoy it. This applies to the surround design as well as your bedroom furniture. No matter what design aesthetic you choose, you can find the right pieces for your space. When looking at all of the furniture and accents you’re putting in your bedroom, don’t choose large designs for all of them. Don’t overwhelm your space with overdesign or it will ruin the relaxation that you worked to create. Instead, choose one focal piece and keep the rest simple. Storage spaces are always highly sought after in bedroom. You don’t want to have too much open storage like you would in the kitchen or living room. In a bedroom, it can quickly feel cluttered and overcrowded. Use storage furniture pieces to maximize the space in your bedroom, but still keep it simple. Under bed storage isn’t a new concept, but new bed frame designs have taken it to new levels. Some companies have designed bedframes that include hydraulics that allow you to lift the mattress and access the empty space in the box spring. From the outside, the bed frame looks like a standard platform bed, but you’re able to take advantage of the previously unused space. Another piece of storage furniture that you can incorporate into your bedroom is a tufted bench. There are a lot of bench designs that allow you to lift the seat of the bench up to reveal a small storage space. The design is very similar to a piano bench, but it has a cushioned seat. When it comes to design accents in your bedroom, you want to them to be soft and support any of the major design elements that you’ve already put in the room. Soft lighting is best for this relaxing space in your home. String lights are a popular option because of their flexibility. They come in a wide range of colors, shapes, and lengths. If you want to have a more standard lighting option, ceiling lights that have attached dimmers can create the soft light that you want in a bedroom. Large mirrors can be incorporated into your bedroom design as well. Not only do they make your room look bigger, but they are particularly helpful when you’re getting ready in the morning. They reflect any natural light coming into your room. Many condos feature an unconventional second floor design. By elevating a space above your standard living space, you can create square footage that you wouldn’t have had otherwise. This is very important when you look at condos in urban areas where square footage can come at a premium. Lofts and mezzanine spaces are the most common among condo renovation ideas. They keep the condo open, but still give you that extra space. A more unconventional design is a lofted bed. This raised floor consists only of a bed and maybe some extra space for bedroom furniture. No matter what second floor design you choose, you will want a safe and stable way to access your space. There are two major categories when it comes to accessing a raised space in your condo: traditional stairs and spiral stairs. Traditional stairs are the most common stair design no matter what kind of home you live in. The straight stair is typically an all wood design and is what you’ll find in a traditional style home. This fits well into condo renovation ideas that call for a classic home design. A traditional staircase can be updated with different metal elements. Cable railing is a popular replacement for standard spindles and metal handrails can update the design. Some minimalist homes decide to glass walls to replace the spindles for a minimalist effect. There are a few drawbacks to having a traditional stair. While it’s definitely stable and one of the safest staircase options, it’s not ideal for most condo renovations. A traditional star has a very large footprint that can take up a large portion of your floor plan. The blocky base of the frame interrupts any air and light flow that you had worked to create in your open floor plan. It can also look very heavy in an bright and open space. Floating stairs can give you an updated traditional staircase design. It features a traditional stair in terms of the steps themselves, but there is no base frame in place. This keeps that entire section open for light and air to pass through. However, many people who choose to install a floating stair usually use a minimalist approach. This means that there is no handrail and the stair has completely open sides. This can be dangerous if you have children or elderly family members in the condo. A spiral stair is another popular condo stair option. Spiral stairs have the benefit of a full steps, like a traditional staircase, but with a small footprint. They take up a small circle in your floor plan, rather than large rectangle that you give up for a traditional staircase. You don’t sacrifice any stability or safety for the small footprint. You can easily fit a spiral stair into the corner of your condo, out of the way from the common living area. You can also choose railing for the face of your loft that will match your spiral stair. This caters to the cohesion of design that you look for in the rest of the rooms. Spiral stairs are completely customizable to fit any design aesthetic that you may want in your condo. Many people associate a spiral staircase with modern home design. The clean lines and simplicity that you can find in a Classic Steel spiral stair definitely fits that model. However, you can customize your spiral stair design to fit into your traditional home as well. A Forged Iron spiral stair is the perfect fit for a Victorian style home. The ornate spindles and solid wood treads create a classic look. Condos are the meeting place of trendy living and benefits of owning your home. When looking to remodel your space, there are several different design aesthetics that you can have. Take advantage of your condo's unique architecture and utilize an open floor plan. It will help your space feel larger and give you more space to work with when it comes to interior design. Dynamic designs, whether they're one floor or two, are key to creating a beautiful living space.